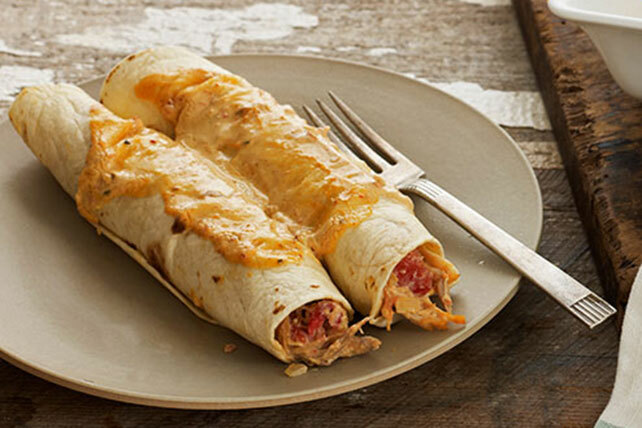 Enjoy Easy Chicken Enchiladas as part of dinner today. This recipe gets its Southwest flavor from a mixture of cream cheese and taco seasoning. Mix cream cheese spread, seasoning mix and milk until blended. Heat oil in large skillet on medium heat. Add onions; cook and stir 4 to 5 min. or until crisp-tender. Stir in chicken, tomatoes, and 1/2 cup each shredded cheese and cream cheese mixture. Spoon about 1/3 cup chicken mixture down center of each tortilla; roll up. Place, seam sides down, in 13x9-inch baking dish sprayed with cooking spray; top with remaining cream cheese mixture and shredded cheese. Cover. Serve with a side of hot cooked rice to round out the meal. Prepare as directed, omitting the oil and substituting 1 lb. extra-lean ground beef for the chicken. Brown meat with onions; continue as directed.